Disney‘s The Nutcracker and the Four Realms is a lavish production with a feeble script. The classic tale is brought to life with considerable artistry, but the filmmakers forgot the plot was equally as important. The visual effects, costumes, production design, and ballet choreography are icing on a bad cake. The surface qualities are good, with bland and uninspiring filler. Mackenzie Foy stars as Clara Stahlbaum, a clever middle child living in Victorian London. Still mourning her recently deceased mother, she’s forced to attend a Christmas ball with her father (Matthew Macfadyen) and two siblings (Tom Sweet, Ellie Bamber). Clara brings along a locked present from her mother. She can’t figure out how to open it. The inventor who raised her mother, Drosselmeyer (Morgan Freeman), dispatches her to his garden for a special key. Clara’s search leads her to a magical world called the Four Realms; where a renegade regent, Mother Ginger (Helen Mirren), threatens war. Clara allies with the Sugar Plum Fairy (Keira Knightley) and the loyal Nutcracker Soldier (Jayden Fowora-Knight) to save the day. The girl power theme is administered ad nauseam. Clara is constantly reminded that she’s bright, beautiful, and loved. She’s showered with adulation throughout. There’s a big problem and she’s the only one who can solve it. I’m all for positive, wholesome female protagonists, but the nonstop affirmation is ruining Disney fantasies this year. 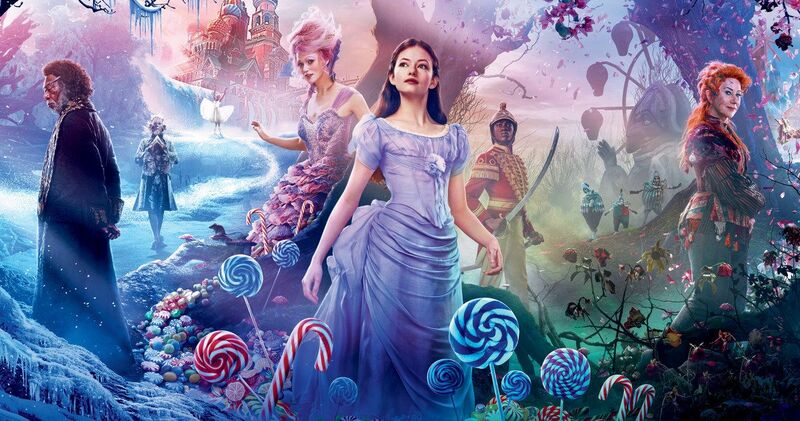 The Nutcracker and the Four Realms doesn’t lay it on as thick as A Wrinkle in Time, but they are born of the same ilk. This story could have been told with much less fawning. Let Clara’s actions prove her mettle instead of continuous reminders of her greatness. The Nutcracker and the Four Realms has two superstar directors at the helm. Principal filming was done by Lasse Hallstrom (The Cider House Rules, Chocolat). Reshoots and post production were done by Joe Johnston (Jumani, Captain America: The First Avenger). Apparently Hallstrom had “scheduling issues” and Johnston was brought in, with Hallstrom’s blessing, to finish the film. Per the Directors Guild, they share a rare co-directors credit because Johnston shot for over thirty-days. I think the break between the two directors is evident. Lasse Hallstrom is known for quirky, character driven stories. Joe Johnston is a master of action and special effects. The script was not up to par from the beginning. Tom McCarthy (Win Win, Spotlight) was brought in for script rewrites when Johnston took over. The director with a bend towards the effects, which to his credit look amazing, completed the story. The plot rings hollow because there was no uniformity of vision through the process. The Nutcracker and the Four Realms needed warmth and enchantment to drive the female empowerment story. That’s hard to achieve when bouncing a film of this magnitude between two tonally different filmmakers. From Walt Disney Pictures, The Nutcracker and the Four Realms does inspire wonderment with beautiful choreography. The American Ballet Theatre’s Prima Ballerina, Misty Copeland, has a fantastic cameo during the second act. Clara is shown the history of the Four Realms as a ballet performance. Copeland dances through colorful set pieces with an assortment of interesting characters. The Nutcracker Suite elegantly accompanying the dancers. The entire film needed to be as magical as this scene. It’s really the only part that truly captures the essence of the classic story and ballet.